Are you a “natural” musician? Are you the kind of person who can hear a song and simply sit down and play it? Do you find it easy to pick up a new instrument, fiddle around for a few minutes, then almost immediately start playing beautiful music? If not, join the club. I’m not a “natural” musician either. In fact, I’ve always been told I was the engineering type, not something that really makes “piano teacher” spring to mind! The simple fact is that most people are not naturally gifted at music. Even a lot of professional musicians’ and performers’ skills are mostly a product of hard work and perseverance. You can look at that as a negative thing, but I think it’s great. That means most of us are on a level playing field when it comes to what we are capable of musically. Most people need some sort of structured learning process to learn how to play piano. But the best way to learn piano are not the same for everyone. Today I’d like to take a look at some of the most common ways to learn to play piano. Let’s get this option out of the way first, since it’s the most common. Traditional piano lessons are how many people get started on piano. Myself included. There’s something familiar about the idea of a piano beginner nervously picking out “Old MacDonald” or “Mary Had a Little Lamb” on an old acoustic as a teacher stands over them, watching. I used to be one of those kids, so let me tell you how traditional lessons usually work. You start simple – learning to find middle C, learning to sit properly at the piano, practicing correct finger placement. Then your teacher gets you started with scales and all sorts of drills to help you find your way around the keys. Scales and drills take up a lot of early lessons, as well as some basic sight-reading practice. After a few months of getting used to all of this, you’ll start working on songs. Like I mentioned before, they’re probably going to be classic lullabies and that kind of thing. You’re still a beginner when it comes to reading sheet music, so practicing the same songs over and over will be important. You might even memorize them, to make it easier (though that can cause problems later on). Each time you meet with your teacher for your next lesson, you’ll spend some time reviewing what you’ve already worked on. The time that’s left will be spent on more practice, plus an explanation of your next assignment. If your teacher holds recitals, sometime later in the year you’ll be ready for your big debut! At my first recital, I wasn’t too thrilled about playing “Three Blind Mice” for an audience, but I did love the cake that was served afterward. As you progress, you’ll start to learn more complicated pieces, with equally complicated sheet music to match. Your teacher will probably start giving you more background on the music theory, and you’ll be expected to devote more time to practice each week. On average, if you keep at this for about 10 years, you’ll reach a reasonably advanced level. You’ll probably even be able to play some nice classical compositions! While you won’t be too clear on how to play popular tunes without sheet music, at least you’ll know a lot more about music theory than many people. Keep in mind – you still probably won’t be anywhere near the level of a professional pianist. They have to spend hours in practice every day for quite a few more years to get to that point. So don’t go out and buy your own tuxedo or performance gown just yet! The pros and cons of this approach to how to learn piano can vary, because different students have different needs and goals. Depending on which category of student you fall into, traditional lessons could be great – or not. For kids who are simply sitting in lessons to please their parents, traditional teaching is still the biggest trend when it comes to piano. It might not really matter that they can’t play songs of their choice – they didn’t get into this by choice, anyway. Meanwhile, for people who truly love classical works and complex compositions, traditional piano lessons are going to the appropriate method of learning. But there are a lot of us who just want to play modern tunes, maybe even accompany ourselves singing. In that case, it simply doesn’t make sense to spend 10-15 years working our way up from “Twinkle, Twinkle” to Tchaikovsky. Most genres of music other than classical can be played quite easily with chord notation, if you know how. And that doesn’t take nearly as long to learn as sight-reading. Once upon a time, the only way for someone to teach themselves piano was by trial and error, plus maybe dabbling in some books on their own. Until the internet came along. Now, it’s easier than ever to find information on just about any topic, including the best ways to learn piano. That’s great, because it means that more people than ever before can access articles, video tutorials, and learning programs. But there is a downside to the trend of learning piano online. When you start by clicking around on YouTube or Google, it’s hard to know where to start. There are thousands and thousands of clips you watch, tutorials you could try to follow, and all of it jumbled into one big chaotic mess. Have you ever done a search for “learn piano”? It’s overwhelming. What would it take to really make the most of piano lessons online? In order to achieve good results, you’ll have to develop a clear plan for your studies. What exactly are you trying to achieve? It’s hard to reach your goals if you don’t have any. Are you trying to memorize a few of your favorite tunes? Build an understanding of music theory? Mimic a traditional piano experience, except online? What’s your learning style? Do you learn best with repetitive, step-by-step instructional videos? Or do you prefer to jump right in and start copying tutorials? Where will you access your learning resources? Can you find specific videos or articles that give you exactly the info you need? How will you organize your piano-learning experience? Will you simply click on random videos when the mood strikes, or are you going to develop a comprehensive lesson plan for yourself? These are the kinds of questions you’ll need to think through if you are trying to learn piano online by yourself. It can be done, but for many people the lack of structure makes self-guided learning hard to stay on track and motivated. Playing by ear – sounds challenging. If you picture this approach, you’re probably imagining yourself listening intently to a new song, then playing it back on your piano or keyboard on your own. No sheet music, just you and the instrument creating a beautiful melody. 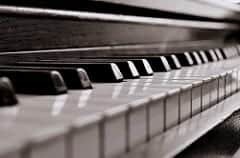 In reality, to play piano by ear is mostly about developing your ability to hear, then find and play, melodies.. Do you have to be a “natural” to do this? Well, that certainly would help! But don’t worry – all sorts of people including myself aren’t naturals, and still can learn to play this way. You have to start with a solid foundation. You won’t be able to easily find what you’re looking for unless you are extremely familiar with your keyboard itself. So the basis for playing by ear should always be grounded in key memorization and plenty of practice finding notes when you need them. You’ll also need to be comfortable with the mechanics of playing. After all, what good would it be to hear what you need to play, then not be able to play it? So you’ll want to spend some time building up skills in both of your hands. And that means you should learn how to play chords and bass notes, not just melody lines. Improvisational skills will come in handy, too. The thing is, what your ears can learn to hear doesn’t have much impact on what your hands can play at this point. If you’re a complete beginner, ear training probably shouldn’t come into the picture much until after you have some actual experience on piano. A good way to start could be my 21-day course. Once you have a strong foundation in general piano-playing skills, what’s next? You can move into “official” ear training. That means learning what to listen for, how to find it, and how to string it all together so the finished result actually sounds good. Music notes exist on a range of higher and lower tones, with a limited set of actual notes. So you’ll need to begin thinking about the contrast between different sounds as you hear them. Are they higher or lower than the previous ones? Do they follow a pattern? Where do different sections of the song (verse, chorus, bridge) differ and where are they similar? You’ll also need to understand a variety of rhythm patterns. Think about it – a lot of songs share similar chords and notes, sometimes in almost the same order. What is it that makes them different from each other? They have different rhythms and different “feels,” as my friend Steve Lungrin likes to call them. Little changes in the way you play the notes together will make a big difference in how the song sounds. Here’s something else to consider. Contrary to what you might think, being able to hear what’s going on in a song doesn’t always mean you should play it exactly as you heard it. There are some musical devices that make sense in the background, but not as part of your interpretation on piano. That’s why it will be important to develop your understanding of “why”, and “how” – not just “what”. You don’t need sheet music with this approach, but chords will be an important backdrop for the melody you create after learning songs by ear. Melody alone sounds weak. Chords alone don’t always get the job done. Personally, I believe that ear training works best when paired up with chord-based playing skills. And there are so many songs to play! Chords are something we’ve probably all heard of. If you grew up with traditional piano music lessons, you probably picture clusters of notes on sheet music – triads. That might have seemed overwhelming back then, and it still might now. Whereas if you have no musical background, you’re probably wondering what on earth a chord… is? Simply put, chords are groups of notes (usually three) that sound good when they’re played together. It really is as simple as that! There are all sorts of musical theory we could get into about why certain notes complement each other, but you don’t even need to understand that to play chords. Do you know how to count? That’s not a trick question – you need to know basic counting skills to play chords. Each chord formula is as simple as finding the root note (the note the chord is named after, then counting to the right by a certain number of steps. For example, a C major chord is named after the “C” note, so start with your thumb there. The formula for major chords is 4-3. That means you will place your next finger 4 keys to the right, and the next finger 3 more keys to the right. That’s all it takes to play a major chord. All you need to do is put your thumb on the root note, and the next two fingers on the other two notes 4 and then 3 keys to the right. Voilà! The other kind of chords (minors, 7ths, etc) all have their own, similarly simple formulas. That’s why chord-based playing the way I teach it can be a lot easier to get started with than sheet music and traditional piano lessons. It works great for songs across almost all modern genres. That said, if you are the kind of person who only wants to play Bach, Mozart, and Beethoven, you can safely ignore this option. The chord-based approach to learning piano isn’t meant for classical devotees. But who is it for? Does that sound like you? If so, my chord-based approach to learning piano online could be a great fit for your needs. The best way to be sure? Check out my free 5-day piano workbook. It’s full of awesome tips and tricks to help you get started.